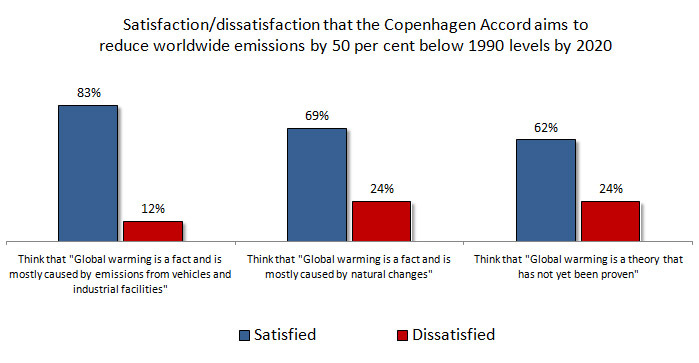 Climate scepticism is on the march, according to the latest British Social Attitudes survey, published last week. The findings indicated that there’s less support for green taxes now than there was in 2000, and more doubt that climate change poses a threat. The findings are important but the survey has one great drawback that has been consistently overlooked. It is that the research was conducted well over a year ago: mostly in the summer of 2010. Why this is so important is because we already knew concern about climate change had fallen in the winter of 2009/10. There was plenty of polling and analysis around then that told us exactly that; this research adds more detail but doesn’t come as a surprise. Importantly, we’ve seen more recent data that suggest that concern has increased since 2010. A poll in the Guardian in January this year showed attitudes had returned to their pre-2010 level. We should be cautious then about assuming that the changes in attitudes shown by the British Social Attitudes survey all still hold true. But doesn’t mean we should ignore the findings. It is no doubt still the case that people are less willing to make sacrifices to tackle climate change when they are feeling under economic pressure. The British Social Attitudes findings are clear that only around a quarter would be willing to pay much higher prices or taxes for the sake of the environment. Even if views have rebounded since then, this is the message that the government is hearing. Hence in 18 months, it has moved from Cameron’s announcement of “the greenest government ever” to Osborne’s claim “we are not going to save the planet by shutting down our steel mills, aluminium smelters and paper manufacturers”. But much polling about climate change can be a poor guide to what people want the government to do. The term ‘climate change’ seems to have taken on a political meaning separate from anything to do with science and risk. Instead, it’s taken by many to represent a left-wing world view, justifying high taxes and dislike of business. While many in this group do believe that something needs to be done to address the threat, they won’t associate themselves with the views of green activists. So when answering surveys, they say that the threat of climate change has been exaggerated and they wouldn’t be willing to pay more taxes to cover it. But they also say that they want action to reduce greenhouse gas emissions. This detail is lost in the current narrative. The debate is instead framed as an antagonism between environmentalists and sceptics. Victory is determined as which of the rival camps can claim the most followers. For those who want action to stop climate change, it’s crucial to realise that this is not the most important metric of success. Many people won’t sign up to the campaign but will support action. The challenge is to tap into this very widely shared desire for action, without expecting all to subscribe to a set of political and cultural attitudes that many reject. This means worrying less about polls that show that many are unwilling to make sacrifices to save the planet, and looking instead for ways to make low-carbon lives not only normal but economically attractive. This entry was posted on Sunday, December 11th, 2011 at 11:34	and is filed under Climate Sock. You can follow any responses to this entry through the RSS 2.0 feed. Both comments and pings are currently closed.